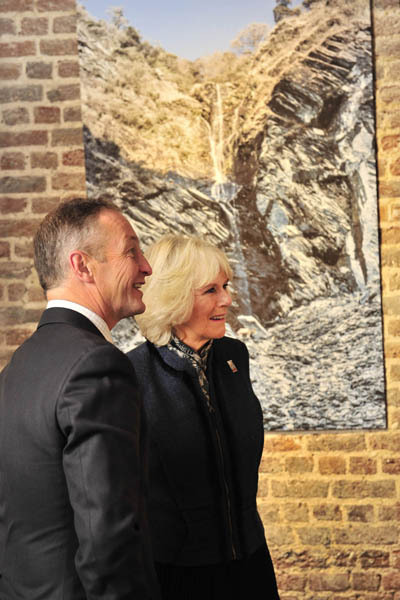 I got a call from The Brooke (an international animal welfare charity dedicated to improving the lives of working horses, donkeys and mules) as their president HRH Camilla The Duchess of Cornwall was to visit a photographic exhibition to celebrate its 80th anniversary. Richard Dunwoody, the retired champion jockey, was the photographer and this was his debut exhibition held in the crypt of St-Martin-In-the-Field (near Trafalgar Square). I wanted to get a picture of them together, looking interested in the exhibition to tell the news story. The problem with this type of shot is that you have two people chatting (one chats, the other reacts, the other chats, the other one reacts) so very seldom are both looking happy and interested at the same time. The other problem is they are both looking in the same direction and at a picture that is on a parallel plane to them… It would never be a classical pose chosen by Michaelangelo. But I had a plan! In fact, I had a floorplan of the crypt with Camilla’s route through the place (see below). I could see from the route there was going to be one good opportunity when they would be looking at a picture with another large picture behind them. I know no one is looking at this thinking they are looking at the mountainscape image behind but it serves as a symbol of the wider activity and creates the relevant context. Not all plans work but this time they turned to the out of shot image, Richard wasn’t obscuring Camilla, both reacted positively and simultaneously… Click.